Let's start of by saying that I hadn't realised this was a zombie book before I started it. And zombie books are not my thing. But this is an interesting variety of zombies, and since I am conv65nced that one day an infectious disease will conquer mankind, this was actually a pretty scary concept to me. But because the summary isn't very clear on this, let me clarify for you: even though it's an interesting sort of zombie, it's still a zombie book. All the things that give me nightmares are in this book: eating of people, apocalypse is near and just basically the scary thing that is a fungus spreading all over the planet infecting people. Also, you don't want a fungus to infect you, cause it's just plain nasty. But if this whole thing works for you, than you'll probably enjoy The Girl With All the Gifts. I have once again discovered that it's not really for me. I did enjoy the first part of the book, where we meet Melanie and the whole class and everyone. I liked Melanie, she's smart and brave and pretty much a good little girl. And she's definitely special and different. I never really got to like Helen Justineau and dr Caldwell is the scientist villain, who also resembles a war criminal, I really hated her. I did respect Sergeant Parks, he's no-nonsense and falls back on his military training, and in the end he's a hero in my book, though I'm still not sure if I necessarily like him all that much. But I could respect him and sometimes that's enough. I was never sucked fully into the story, while I cared in the beginning what was happening to Melanie, I just couldn't see her the same way anymore after one particular scene. I also felt that there were a couple of too-stupid-to-live moments from more than one of the characters, who are supposed to be pretty smart, so that was off-putting for me. 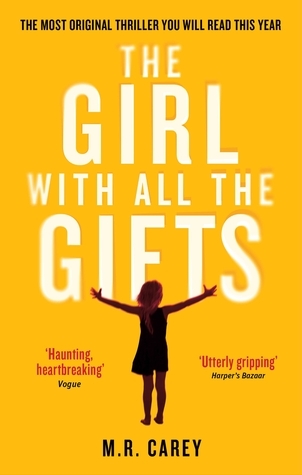 About halfway through I found myself a bit bored and I know so many people have loved The Girl With All the Gifts, but honestly, I'm feeling a bit meh about it. I considered DNF-ing it, but because I'd heard such good things about it, I made it all the way to the end, but I'm not sure if it was worth the time I put into finishing it. Everything felt so bleak, that I never had any hope at all and was constantly thinking 'well, this really can't end well', which somehow made it not as scary as it should have been and just a bit me waiting for things to start going south. Which I'm obviously not going to tell you about if I was right or not cause if this is your kinda book you should probably read it as lots of people did like it. This basically just wasn't the book for me, and if you're not into zombies, then you probably won't like it either. This could be a case of 'it's not you, it's me', but with me really meaning it. Be warned that there are some pretty gruesome things in it. I just downloaded this one, I love zombies (watching Walking Dead right now) and have heard good reviews from other zombie lovers. Sad you didn't enjoy it! It's a shame you didn't like this one. I didn't know it was a zombie book either, but I ended up loving it. It did get slower in the middle, but I guess it was kind of needed in the story. And I love gore and the apocalypse and being scared out of my mind, so this was great for me. I too have heard a lot of good things about this one, but haven't got around to officially adding it to my TBR list yet. I've never read a zombie book before, but zombie films aren't really my favorite (though I did like Zombieland and, to an extent, Warm Bodies). Will have to think long and hard about picking this one up. Thanks for the review! Warm Bodies is a pretty decent book too! I actually seen the movie then found out it was a book first.